Bright Young Things by Anna Godbersen, author of the bestselling Luxe series, introduced the girls of 1929, girls with big dreams and big secrets in the big city of Manhattan during the Jazz Age. Each girl had a different fate. One would marry. One would find fame. And one would die. Lucky Ones, the thrilling conclusion to the glamorous Bright Young Things series, reveals the destinies of Broadway baby Letty Larkspur, bootlegger’s daughter Cordelia Grey, and flapper Astrid Donal. Letty’s dream of fame is within her reach. Cordelia is the midst of a whirlwind romance with celebrity pilot Max Darby. Socialite Astrid is a new bride. But secrets and scandals could destroy their happiness as the last summer of the 1920s reaches its peak. As with Reached, I actually considered not finishing this series. I really loved The Luxe series, even though it could be a tad dramatic at times. Even still, I love historical fiction so I fell hard for the series. I was excited to find out about The Bright Young Things series because the 1920s is such a fascinating period of time. While I didn't review the first two books on the blog, I thought they both fell a little flat. They were missing that spark that made me fall in love and want to lose myself in their pages. With three heroines, each book alternates chapters between the three leading ladies. I never felt myself connect to the any of the characters, which is likely why I felt rather apathetic about finishing this series. I added it to my Summer Series Challenge list at the last minute, and I immediately put in a request for it from the library. I knew that I didn't really want to buy it because I wasn't 100% sure that I was actually going to read it. It came in for me right away, and I decided to dive right in. While I enjoyed this one more than the previous two books, I still felt really disconnected from everything that was going on. I really wasn't too concerned with the characters or their fates, which doesn't necessarily bode well for a book. I think this series tries to accomplish too much. With so many lead characters and so many different storylines, there's a lot happening in not many pages. While it means the book moves quickly, it also meant that there wasn't enough character development for me. People fall in love pretty quickly - and there isn't enough build-up to really make you root for or care about any of the relationships. The action picked up a lot at the end, but it still felt all over the place. There was just so much going on! 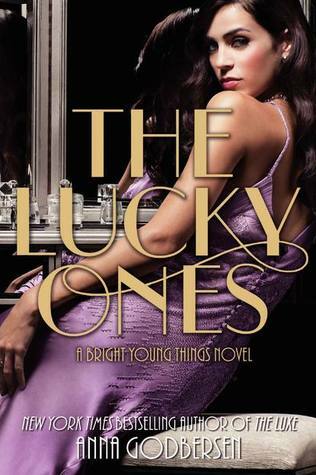 While I finished The Lucky Ones quickly and enjoyed it more than the previous books, it was still a lackluster read. I just kept thinking that the entire series really could have been tightened up and told in one book. If you've already started this series, I'd actually tell you to finish it out because Godbersen throws some surprises in at the end. I certainly didn't see everything ending the way it did! "City dwellers are people who won't sit still. Every year they move faster and find new activities to absorb their manic energy. They parade and they cheer, they showboat and they observe, they play elaborate games of hide-and-go-seek as though the concrete canyons were some kind of buzzed-up jungle gym and, as long as they keep playing, none of them will ever grow old." I've been very on the fence about this one, so good to know your thoughts. I think if I do get around to it I'll definitely go the library route! Yeah, I'd definitely go the library rout with this series! I've been wondering about this series since the first book came out. In fact, I actually OWN the first book but I've never read it. And I love the covers. But it's a bummer that it falls flat as a whole. Isn't it kind of funny when the last book tends to be the better book? I kind of/almost feel that way about Requiem - there are parts to it that I LOVE while it has it's "other" parts too. Anyway, off topic here! I love the covers, too, and I actually really enjoyed Anna's Luxe series. So it was kinda sad that the series wasn't that great as a whole. It wasn't bad - just really fluffy and dramatic. But it does make me sad when the last book is the best because it gives you an idea of how much better the series could have been!